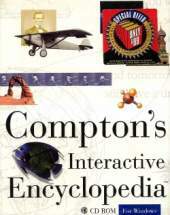 Compton's-1995 contains the complete information of a 26-volume encyclopedia on a single CD-ROM, and includes over 33,000 articles, more than 7,000 pictures, over 100 videos and animations, and over 14 hours of sounds. Primary operation of Compton's-1995 is through an information search bar on the left side of the screen, dialog boxes, and a menu bar across the top of the screen. The menu bar contains On-line Help, Events Highlights (gives you a short slide show about recent historic events), Editing Room (used to create your own multimedia presentations by combining and arranging any of the information in Compton's-1995), Bookmark (for returning to information at a later time), Picture Tour (browses through pictures in the encyclopedia, either the complete tour or one of 15 available categories), Notebook (for keeping notes -- you can paste text and pictures here), Dictionary (Webster's New World Dictionary), and Setup/Preferences (for changing program settings). There are several ways in which you can search for information: Contents (alphabetical listing), Idea Search (typing a word, phrase, or question will result in a list of related articles, pictures, movies, sounds, and tables), Infopilot (finds groups of articles related to a topic), Topic Tree (displays articles arranged by topic and subtopic for narrowing your area of interest), Atlas, Timeline (charts people and events in U.S. and world history), and Explore (takes you into four different settings to explore information in the encyclopedia in a different way). The "Guided Tour" gives you an overview of the encyclopedia presented by Patrick Stewart. InfoPilot, is a cool trick which lets you pick a central topic — say, baseball — and view related topics, like Babe Ruth or card collecting, arrayed around the main entry. It's handy and makes browsing through Compton's 33,000 entries a breeze; unfortunately, the text-heavy approach doesn't let you enjoy your explorations the way Encarta does. It was published in 1993, 1995 through 2001.